Rayna Simons was born in Chicago in 1894. Her father was a successful businessman and was a former president of the Board of Trade in the city. She was brought up in a loving and wealthy family. Rayna became a student at the University of Illinois. While at university she met Dorothy Day. The women became close friends and Day later recorded in her autobiography, The Long Loneliness (1952): "On many occasions I had noticed a young girl, slight and bony, deliciously awkward and yet un self-conscious, alive and eager in her study. She had bright red curly hair. It was loose enough about her face to form an aureole, a flaming aureole, with sun and brightness in it. Her eyes were large, reddish brown and warm, with interest and laughter in them... I saw her first on my way to the university in September. She was the only person I remember on a train filled with students. She was like a flame with her red hair and vivid face. She had a clear, happy look, the look of a person who loved life.... I can see Rayna lying on her side in a dull green dress, her cheek cupped in her hand, her eyes on the book she was reading, her mouth half open in her intent interest." During this period the two women read the socialist novels of Upton Sinclair and Jack London. They joined the American Socialist Party and read the speeches and writings of William Haywood, Mother Jones, Elizabeth Gurley Flynn and Carlo Tresca. They also went to lectures given by Rose Pastor Stokes, Scott Nearing and Edgar Lee Masters. Jim Forest argues in his biography of Day, Love is the Measure (1986) that: "The two became inseparable... The fact that she was Jewish meant that, despite family wealth, personal warmth and brilliance as a student, Rayna was invited into no sorority. 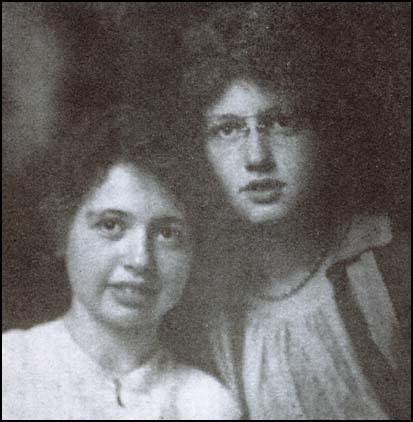 Through Rayna, Dorothy had her first contact with anti-Semitism... During the summer, Dorothy stayed on a farm owned by Rayna's father, and in the fall she accepted Rayna's invitation to share her room in an Urbana boarding house for Jewish girls." Inspired by the events of the Russian Revolution, Rayna joined the American Communist Party. After her marriage to William Prohme, they moved to China. In an article published in May 1924, Prohme wrote: "I am going to stay five years in China. I want to see for myself what happens to a people when their friendly familiar world suddenly becomes strange and bewildering. When their age-old social customs are being overthrown, when their religions are being challenged, their houses, their cities, their language, their clothes, their very thoughts are being transformed. I want to see what happens to them - and help, if I can, in the task of keeping the new forces under control, of preventing the changes from coming too fast's." Rayna and her husband became supporters of the Kuomintang (National People's Party) led by Sun Yat-sen. They edited the Kuomintang’s English-language newspaper in Wuhan. They both associated with Mikhail Borodin, who had been sent to China by Lenin in September 1923. Henry Misselwitz, who worked for the New York Times, admitted that he had to go through Prohme to reach Borodin: "Naturally I wanted to see him (Borodin) in Hankow. The appointment was arranged by Rayna Prohme, a dynamicyoung woman from Chicago, then editing The People's Tribune, organ of the Red rule. She was the wife of William Prohme, another journalist of rare intelligence who at that time was head of the nationalist News Agency - a propaganda organization in Shanghai." In 1926 Rayna met the journalist, Vincent Sheean. A mutual friend had described her as a "red-headed gal... who spit fire, mad as a hatter, a complete Bolshevik." Sheean was immediately taken by her: "She was slight, not very tall, with short red-gold hair and a frivolous turned-up nose. Her eyes could actually change colour with the changes of light, or even with changes of mood. Her voice, fresh, cool and very American, sounded as if it had secret rivulets of laughter running underneath it all the time, ready to come to the surface without warning... I had never heard anybody laugh as she did - it was the gayest, most unself-conscious sound in the world. You might have thought that it did not come from a person at all, but from some impulse of gaiety in the air." Rayna and Sheean went to Moscow together. Rayna wanted to study at the Lenin Institute "to be trained as a revolutionary instrument". Sheean was against the idea arguing that Marxism was "a false cloud". 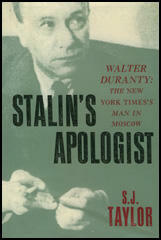 According to Sally J. Taylor, the author of Stalin's Apologist: Walter Duranty (1990): "They took rooms together, arguing late into the night about her decision. But she found the debates tiring, and often had trouble getting out of bed the following morning." While on a visit to the apartment of Dorothy Thompson, another journalist based in the Soviet Union, Rayna fainted. 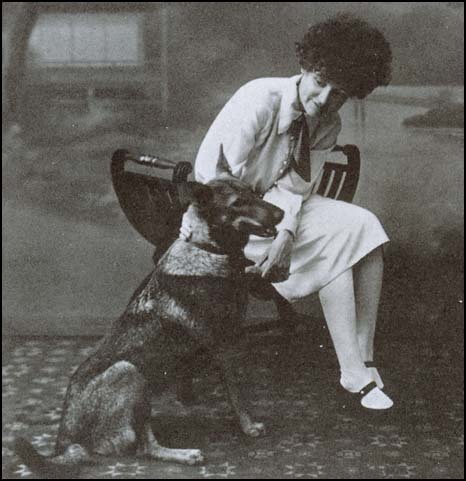 She soon became extremely ill and Sheean's friend, Walter Duranty, arranged for her to be seen by a local doctor. Rayna told Sheean: "The doctor thinks I am losing my mind and that is the worst thing of all. He won't say so, but that is what he thinks. I can tell by the way he holds matches in front of my eyes and tests my responses. He doesn't think I can focus on anything." Vincent Sheean and Anna Louise Strong attempted to look after Rayna Prohme. He later wrote to Helen Freeland: "About Anna Louise (and this is strictly between us): she is a fine woman, but overpowering isn't the word for it. Nervous energy, physical strength, etc., etc., and a quite unbridled enthusiasm for every Communist fact or fancy. She nearly drove Rayna to distraction during that last week. This in spite of the fact that Anna Louise was overwhelmingly kind, efficient, and good. It was something Rayna couldn't help. She used to say to me: 'For God's sake get Anna Louise out and keep her out; I cannot bear having her in the room'. I did so as much as possible, but of course Anna Louise was very much there most of the time, or large parts of the time. For God's sake don't repeat this; I've told nobody but Bill about it; it seems rather hard on Anna Louise, who really meant so well and did so much; but the unfortunate woman has such a blustery character that one can't bear being with her much. I shared to the full Rayna's feeling about her, and was ashamed of feeling that way (as was Rayna)." 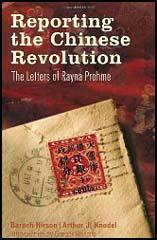 On 9th November, 1927, Rayna wrote to her husband, William Prohme, who was still in China: "I am doing very little work, but things are falling into place a little bit. It has been so completely disorganized so far and I have been laboring under this wretched cloud of headache and foggy mind. My mind is queer, Beanie, sometimes I think actually not right. Do you suppose I could be getting dementia praecox or some other mental disease? Else why should I have these maddening lapses of memory? I can't make it out.... I am getting books and in spare minutes I am going to try to make the mind work again. Whether it will or not, I don't know. I feel that it is ageing - on the downgrade. You will think that foolish of me, but really Beanie, I am not as young as I once was, in looks, brain, spirit, anything. I have a feeling of definite age when I am with very young people - 20 and 21, or even more. It comes on me all of a sudden. I never felt that before." Vincent Sheean recalled in his autobiography, Personal History (1933): "She had spoken vaguely of the fear before, and all I could do was say that I did not believe it was well founded. But on the next day she felt certain that this was the case, and it kept her silent and almost afraid to speak, even to me. I sat beside her hour after hour in the dark, silent room, and blackness pressed down and in upon us." Sheean said that two or three times she raised her voice to say: "Don't tell anybody". Rayna Prohme died of encephalitis, or inflammation of the brain, on Monday, 21st November 1927. On many occasions I had noticed a young girl, slight and bony, deliciously awkward and yet un self-conscious, alive and eager in her study. She had bright red curly hair. It was loose enough about her face to form an aureole, a flaming aureole, with sun and brightness in it. Her eyes were large, reddish brown and warm, with interest and laughter in them... I can see Rayna lying on her side in a dull green dress, her cheek cupped in her hand, her eyes on the book she was reading, her mouth half open in her intent interest. She (Rayna Prohme) was slight, not very tall, with short red-gold hair and a frivolous turned-up nose. Her eyes... could actually change colour with the changes of light, or even with changes of mood. Her voice, fresh, cool and very American, sounded as if it had secret rivulets of laughter running underneath it all the time, ready to come to the surface without warning... I had never heard anybody laugh as she did - it was the gayest, most unself-conscious sound in the world. You might have thought that it did not come from a person at all, but from some impulse of gaiety in the air. I am going to stay five years in China. I want to see for myself what happens to a people when their friendly familiar world suddenly becomes strange and bewildering. When their age-old social customs are being overthrown, when their religions are being challenged, their houses, their cities, their language, their clothes, their very thoughts are being transformed. I want to see what happens to them - and help, if I can, in the task of keeping the new forces under control, of preventing the changes from coming too fast. Naturally I wanted to see him (Borodin) in Hankow. The appointment was arranged by Rayna Prohme, a dynamicyoung woman from Chicago, then editing The People's Tribune, organ of the Red rule. She was the wife of William Prohme, another journalist of rare intelligence who at that time was head of the nationalist News Agency - a propaganda organization in Shanghai. Both are now dead. Rayna (as everyone came to know this quite amazing girl with her shock of flaming red hair) died some years ago in Moscow of overwork and brain fever; Bill died in 1935 in Honolulu, after suffering for years from a pulmonary illness. Despite political differences, all who met Rayna and Bill were influenced by their personalities and their clarity of vision. In Hankow, Rayna was very much alive and arranged my entree to the great man's sanctum that week in late April (1927) with no apparent trouble. She said: "You want to see Borodin? Okay, I'll see what can be done". I got a note the third day I was in Hankow, telling me that the meeting had been arranged. I've been recovering from the two weeks of headache and also as I've been worried about you. It has distressed me and is a steady undercurrent. I haven't had a single word from you since the cable saying you had arrived. I don't know what you are doing. I sent a cable to you but got no answer. I do not understand and am fretting about it so much that everything else merges into the background. You will want news and there is damned little to give. Madame Sun is back. I had been harboring hurts because I had not had a line from her, but she tells me she has written and from what I know of the mails, I can well believe it; so the hurt is gone. That happened just this morning and it has had a startling effect on my disposition. I suppose I had been brooding a bit. I am doing very little work, but things are falling into place a little bit. It has been so completely disorganized so far and I have been laboring under this wretched cloud of headache and foggy mind. My mind is queer, Beanie, sometimes I think actually not right. Do you suppose I could be getting dementia praecox or some other mental disease? Else why should I have these maddening lapses of memory? I can't make it out. My mind goes wandering off into the most irrelevant fancies and I don't seem to be able to check it - nothing worth thinking, just repetitive stuff, a thought over and over, or two thoughts, disconnected. I really am not functioning normally half the time. Scott Nearing is here but I have scarcely seen him. Many other people are here, too but they all belong to particular delegations and I am in none of them. Things go on - and I read about the Taiping rebellion, for the chief. He is going to do a good piece of work, I think, if he ever gets down to it. When that will be, God knows. I wonder about you just about a third of the day. What are you doing in Manila? If I don't hear in a day or two, I shall wire again. I find it hard to go on this way, uncertain, not knowing, without plans or reason. I am studying in the times between but with a very hazy mind. By two people, one of them the chief and the other a very anti, I've been told in the last two weeks that I am in desperate need of background. When I examine my mind, I have to agree with them. I must study, but seem out of the rut of it. It comes hard. But there is a desperation shoving me - very like that I had after I was emerging from the cloud of New York and unhappiness there. The last two years have been so full of things. In so many ways, I feel growth; in so many others, utter stagnation. Do you have that feeling, too? I wonder. I am getting books and in spare minutes I am going to try to make the mind work again. Whether it will or not, I don't know. I feel that it is ageing - on the downgrade. You will think that foolish of me, but really Beanie, I am not as young as I once was, in looks, brain, spirit, anything. I have a feeling of definite age when I am with very young people - 20 and 21, or even more. It comes on me all of a sudden. I never felt that before. I never used to feel that these people in the twenties were babies. I do now. Do you suppose that in a few years, say ten or twelve, all people under forty will seem children and we'll be calling people who are uncles and aunts, the girls and the boys? There are bald spots on many of the men who seem to me mere youths now - and the women have wrinkles. I have a few myself. Rayna was here, as you know, with Madame Sun Yat-sen, Mr. Borodin, Mr. Eugene Chen, and the other leaders of the Nationalist movement in China. She arrived September 8, or thereabouts, with Madame Sun, from Shanghai. She was apparently in perfect health and very good spirits about a week later, when I arrived from China. I am a newspaper correspondent and knew Rayna in Hankow. I left Moscow for London, was gone about five weeks, and returned on November 7 - two weeks ago today. During the first of these two weeks Rayna seemed, for the most part, all right, although she gave signs of exhaustion and some nervousness. On Friday, November 11, she fainted for the first time, in the room of a friend (Miss Dorothy Thompson, special correspondent of the New York Evening Post) but recovered in an hour or an hour and a half, and was able to attend a meeting that night. On the next afternoon she collapsed completely, while she was talking to the leaders of the Chinese Labor delegation here. She was removed to the room of Anna Louise Strong, the American writer of whom you have no doubt heard, who is a friend of hers from China. Rayna passed a bad night, but was much better the next afternoon and asked me to countermand the cable she had wished sent to you. I did so, and have been sorry for it. However, Rayna improved during the week. On Friday (three days ago) she was particularly sprightly and happy. At no time has she left her bed except for the journey to her bathroom, a few feet away; but at the same time we all thought she was suffering from a simple nervous collapse which could be remedied by time and rest. The doctor in charge of the case was Dr. Link, the German Ambassador's physician, who is considered the best foreign doctor in Moscow, and who had the additional advantage of being able to talk English to Rayna. He, as we now learn, had the strongest suspicions of the true nature of the disease all along. He did not wish to make a positive statement, however, under until Rayna was in condition to be subjected to an examination by the brain and nerve specialists. At first a stomach disorder (of the nature of ptomaine or autointoxication) impaired the possibilities for the doctors; they were unable to tell exactly how the brain was affected, and how far. The stomach disorder disappeared by about Friday, but on Saturday the brain disorder became more marked; Rayna began (in the evening) to lose control of her senses. Yesterday (Sunday) morning she was a good deal better again; but in the afternoon (at about 2:15, I should say - I was there) she sank into a sleep from which she did not again wake. Towards nine in the evening she spoke again, but it was not possible to tell what she was saying. This morning at about ten minutes to eight she died.